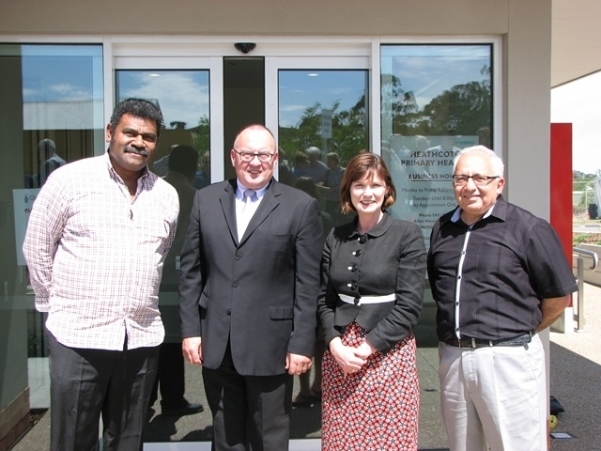 Heathcote Health staff and members of the community came together recently to celebrate the official opening of the Heathcote Health Primary Care redevelopment. The $2.9 million dollar facility was opened by the Parliamentary Secretary for Health, Ms Mary-Anne Thomas MP and Heathcote Health board chairperson Mr Wayne McKay and had a strong crowd consiting of service providers, staff and members of the commuinty in attendance. The redevelopment involved the removal of existing maintenance and storage facilities to allow for the construction of a new Primary Health facility as well as the refurbishment of a number of existing rooms and the modernisation of key IT infrastructure. community as well as attracting a wider range of health services to the area”. Mr McKay thanked the Victorian Government for its support of the redevelopment. “It takes a certain amount of faith to entrust a small rural health service with the responsibility of managing both the funds and the project, and I think the modern facility you see before you today is repayment of that faith. These facilities will be able to deliver more services locally which will be a huge benefit for a rural community like Heathcote”. Mr McKay paid tribute to the Heathcote Health project team who managed the redevelopment as well as the builders, Raysett Construction, the Heathcote Primary Health team as well as the other primary and allied health providers who use the health facility. “Moving from the old rooms to the new facility has caused disruption and inconvienience to many parties and the willingness of service providers and members of the community to accommodate change and to be flexible was a contributing factor to the smooth running of the redevelopment” Mr McKay said.